Natasha began her dance training at Atkinsons Dance Academy in 2004. Natasha is trained in Classical Ballet, Contemporary, Jazz, Musical Theatre and Graham. Natasha graduated from Roseville College in 2016. Natasha completed her Diploma of Dance (Elite Performance) at Brent Street in 2017. She has completed all of her Royal Academy of Dance (RAD) Classical Ballet examinations to an exceptional level including up to Advanced Two and is currently studying Solo Seal. 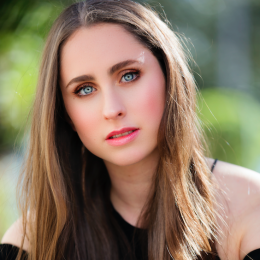 Natasha was accepted into the Professional Intensive Program with Sydney Dance Company in 2018. Natasha has completed all of her AMEB Speech and Drama examinations, obtaining a High Distinction for Grade 8 in 2014. Furthermore, Natasha obtained a Distinction in her Diploma in Performing: Speech and Drama from the Associate of Trinity College London (ATCL). Natasha has been involved in a contemporary performance at the Lyric Theatre. She has performed in a material interaction collaboration displayed in numerous art galleries. Natasha is currently undertaking further studies at university studying Commerce – Professional Accounting.